This free woodworking plan is for a under cabinet mounted knife rack. 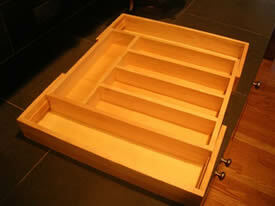 It's a very useful and what looks like, simple woodworking project to build. The plan comes with all of the dimensions, diagrams, and instructions you will need to construct this project. Oh, the nice thing is that you don't need very many tools to build this one. Give it a try. Lee's Wood Projects - How to Make a Wood Cheese Board. 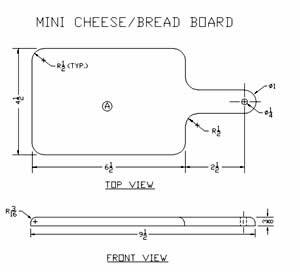 This mini cheese-bread board is perfect for slicing cheese or bread. 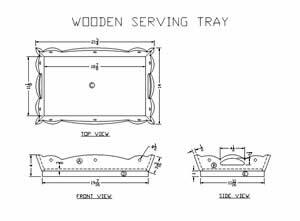 Lee's Wood Projects - How to Build a Wooden Serving Tray. This stylish wooden serving tray is useful for carrying a meal into the TV room so you won't miss that important program while you eat. 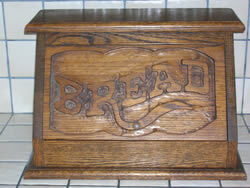 How to Make a Wooden Bread Box - Lee's Wood Projects. This stylish wooden bread box will help keep your bread and rolls fresh for many days.